It’s highly suggested that you find a job and do the work that you enjoy doing. After all, you spend at least eight hours a day doing whatever it is you do at work. Sometimes, even more. It would be very difficult to imagine going to a job every day that you absolutely hated. Unfortunately, many people do it. 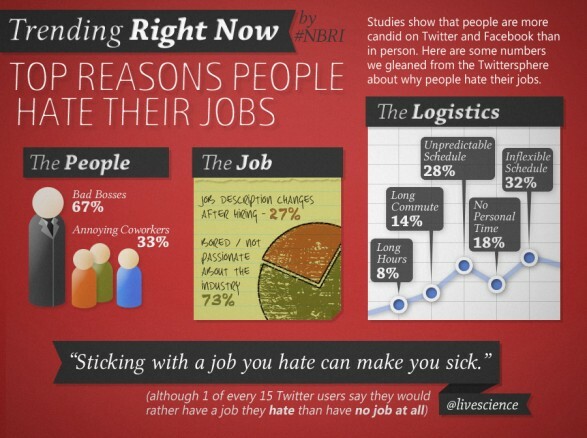 However, this infographic from Visual.ly created from statistics gathered by the National Business Research Institute, shows that most people don’t cite the work they do as the main reason for hating their jobs. Believe it or not, most people that hate their jobs hate it because of the people they have to work with. In fact, 67 percent of the people surveyed that hate their job say they hate it because they have a bad boss. 33 percent say it’s because they have annoying coworkers. Perhaps this is why company culture and understanding how things work before hand is so important to each and every business. We are all human and it is human nature to communicate and interact with other humans. However, if the human interactions you encounter each and every day are terrible, unsatisfactory or chip away at your happiness, then you are likely left stressed, depressed and unhappy. On the other hand, 73 percent of workers said they hated their job because they were bored or just not passionate about their industry. This shouldn’t be too surprising seeing as though many workers are jumping out of their original industry and into new ones in order to find a job and a sufficient paycheck. On top of that, many people don’t follow their passion because they can’t make the money they want doing it. Even if the money is better, though, sticking with a job that you hate can literally make you sick. Stress, frustration and anxiety can really take a toll on your body and your mental and body health suffer as a result. Another not-so-surprising statistic is that one out of every 15 users that participated in the survey stated they would rather have a job they hated than no job at all. When bills have to be paid and you have to find some way to put food on the table, of course a less-than satisfactory job is better than none. Although our job market and economy are starting to pick up, we still don’t quite have the luxury of being picky and choosy, and quitting our job on a whim. If you are one of those workers that hates your job because of the people you work with or for, then take a couple breaths, step back and see how you can try and rectify the situation. Is it an inappropriate boss? Take action. Is it an annoying or unruly coworker? Then know how to deal with office politics. In addition to these things, make sure you are careful and thorough when looking for a job. If you are offered a position, think about it for a while and make sure you ask questions. You need to do everything you can to learn about the company and its culture before you sign on to work with them. Take a look at the infographic for yourself here below. Do you hate your job because of a bad boss or annoying coworkers? Have you made attempts to rectify the situation and still nothing has changed? Tell me about it in the comments or tweet me @nicole_spark.